See more objects with the tag stripes, domestic interiors, curtain, bedding, trompe l'oeil, gathered. See more objects with the color tan lightgrey peru or see all the colors for this object. This is a Textile. It was made by Stead McAlpin & Co.. We acquired it in 1991. Its medium is cotton and its technique is screen printed on plain weave, glazed. It is a part of the Textiles department. Literally translated as “deceives the eye,” the French term trompe l’oeil refers to a technique that has been employed by artists for centuries and usually uses a two-dimensional plane to suggest a fictional three-dimensional space. 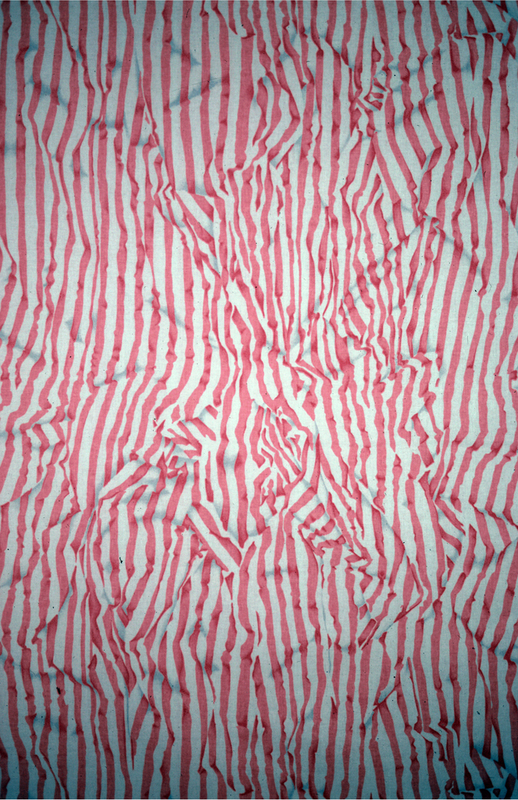 This type of optical illusion has been applied to textiles in a variety of innovative ways. Panache, designed by Anne White, is an image of a striped fabric that has been gathered or ruched, printed on woven cotton. Here, the use of a trompe l’oeil effect suggests more fabric than is actually present in a given length of the design. White designed this pattern, originally in twelve different colorways, for Warner Fabrics, a company famous for pushing the postmodern envelope. The self-reference of a fabric within a fabric is an example of how designers can express post-modernist ideas through textiles. The design firm values creative freedom for their designers who, in the 1980s took fresh, ironic perspectives on historic style fabrics. The country home look, complete with balloon shades, had become fashionable in interior design and Panache, which seems to reference the voluminous window treatments, was a bold reaction to that trend. This object was featured in our Object of the Day series in a post titled A Fabric Within a Fabric.